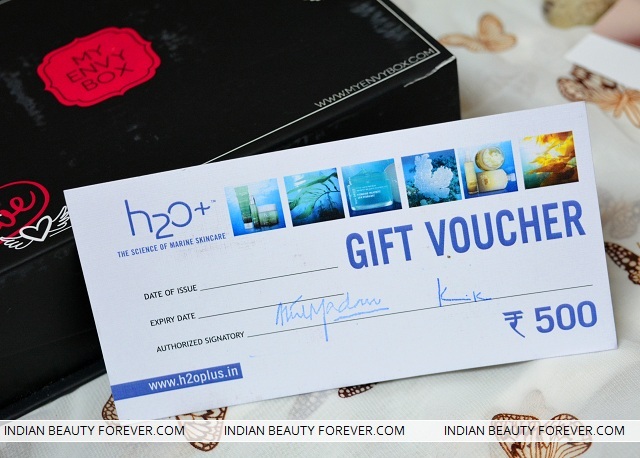 This box of love is curated by the Miss Malini’s Team for My Envy Box and guess what this box has some really interested stuffs. 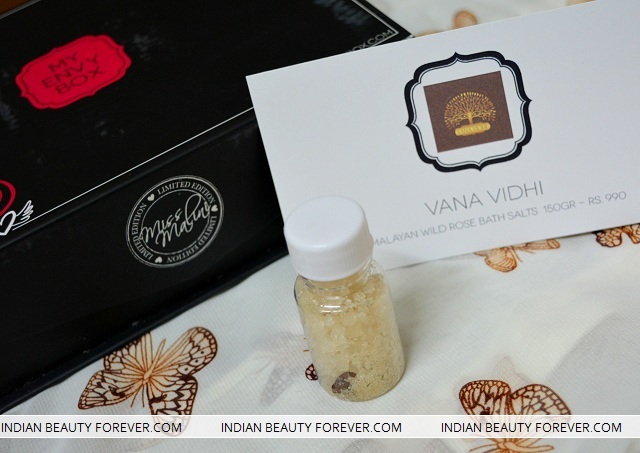 By the way, I liked that cutesy black box with some quirky symbols and the Miss Malini Limited Edition Seal over it. This is a useful product as post the workout there are impurities and bacteria’s over the body hence this neem scrub detoxifies the skin and gets rid of the impurities by gently exfoliating. I get fascinated by skin care products that have neem in them since I have and acne prone skin. This is something my mum is going to love. 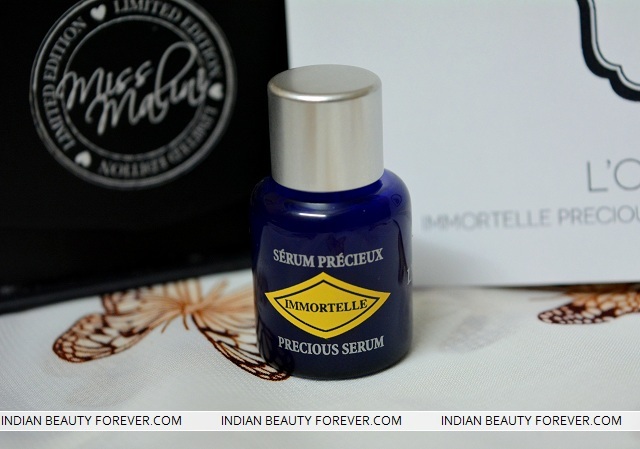 This serum has the concentrate of 1000 anti aging immortelle flowers which enhance the skin’s collagen and reduce lines and wrinkles. 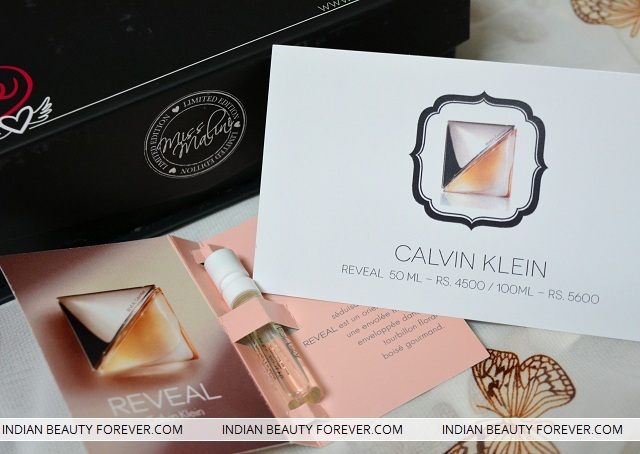 The brand says that it is a sensual oriental scent with the rich base notes of sandalwood, cashmere and musk. It is a perfect feminine fragrance for the warm evenings. I haven’t heard about this brand. It’s a new brand and I hope it come out as a promising brand. When I opened this tiny bottle, it oozes out the rosey scent. I will use it soon. The only thing is that the crystals are too chunky and I don’t like the bath salts to be like the salts but I think I need to melt them before using it. Finally a makeup product in My Envy box was a quite pleasant surprise then I recalled, this is being the Miss Malini Edition box. It’s a French brand and I got an orangey coral color which I loved. Other than that there was a 500 s H20 Plus coupon and a free makeover at Sephora. 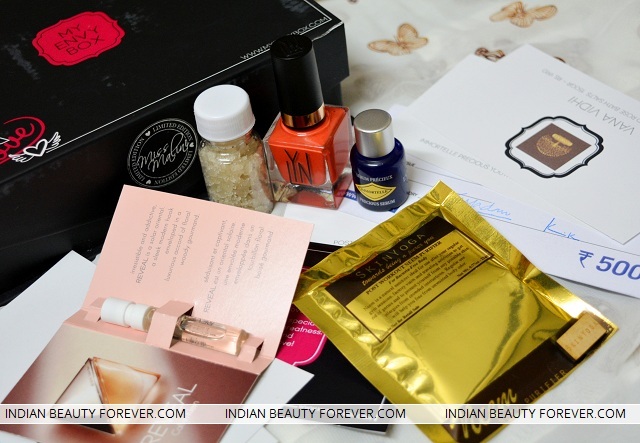 So, did you receive your February My Envy Box? How do you like the product? PR sample though the views are honest as always!! Voucher and nail polish looks tempting.